Recently published research investigated the omega-3 index in patients with heart failure to explore association and potential prediction of risk. The omega-3 index is the sum of EPA and DHA in erythrocyte membranes. Blood samples from 899 subjects with systolic heart failure were analyzed for fatty acid composition. The authors concluded, “Our results show a marked depletion of omega-3 fatty acids in patients hospitalized for decompensated heart failure (suggested target range 8-11%). Although the O3-I was associated with a panel of established risk indicators in heart failure, it did not predict mortality risk.” In a previous study from last year, authors had suggested that although omega-3 PUFA supplements might be beneficial in HF [heart failure] patients, especially in DCM [dilated cardiomyopathy]patients, further studies were needed. 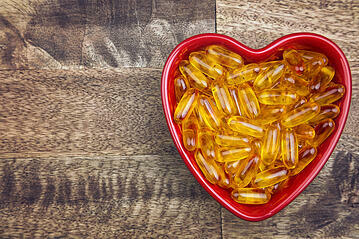 Evidence continues to increase showing the benefit of omega-3 fatty acids for cardiovascular health. Another, earlier meta-analysis of studiesaddressing omega-3 fatty acids and heart failure found that the consumption of omega-3 fatty acids decreased the risk for heart failure, simply eating fish lowered heart failure risk.